NOAA claim that 2014 was the hottest year on record, with global temperatures 1.24F above the 20thC average of 57.0F. This is all very strange, because back in 1997, they said global temperatures were 62.45F! Now I am quite sure that temperatures have not really dropped by 4 degrees, or else glaciers would by now be advancing over the hill. And I do realise that NOAA and the rest like to talk in anomalies, rather than absolutes. Nevertheless, if we have got so little idea of what global temperatures are, can we honestly have much confidence in claims of warmest years based on a few hundredths of a degree? All of this though does raise a much more serious issue. How much of this four degree difference can be explained by ocean temperatures? NOAA did not show the splits for Land & Ocean in 1997, so we can’t say. There were huge gaps in the SST record, prior to the introduction of ARGO in the early 2000’s. Put simply, they had no idea what global temperatures were then, and therefore it is impossible to know whether it has got any warmer since. Back in 2007, NOAA offered this list of the 10 warmest years. We discover that the anomaly for 2005 has increased from 0.60C to 0.65C. Similar increases have taken place in the other years. For instance, 1997 has been adjusted up by 0.06C, as has 1998 and 2006. This has happened for the simple reason that the 1901-2000 baseline has been adjusted downwards, in other words cooling the past again, and all in the space of a few short years. It’s funny how these adjustments always seem to go in the same direction! I wonder when DOJ Holder will open an investigation? I would opt for the RICO approach, organized crime and racketeering. This law definitely applies. The adjustments are being coordinated to bolster “act on climate” legislation for the investors / promoters in Big Green. If the marketing department of the Big Green “securities firms” are persuading the government agencies into inventing false information to build the attractiveness of the Big Green prospectus, that is securities fraud, among others. The investors are hoping to enact legislation that is perhaps the largest “investment” (rip-off) of taxpayer funds in history. It will be 100% free money to the investors, and a 100% waste of money to the victims. Note 98 is even higher than 97. There needs to be a clearly defined narrative for why we think all these adjustments have been performed. This sounds simple, there are a number of probable motives for the adjustments but these suggested motives need to combined and covered in one to two simple sentences. This is important because the opposing side of the argument will try to play a trap asking us if we are disputing all 20th century warming, we will say we accept there was some 20th century warming but less than what the adjusted data shows, and they will then ask what are we making a big deal of to try to diminish importance of what has been uncovered. This is pretty important in terms of Congressional hearings in the U.S.
Cooling the past is done to show significant global warming has occurred. Global warming is assumed to be anthropogenic because the natural drivers are assumed to be too small. Anthropogenic Global warming causes anthropogenic climate change because there is no natural climate change. Retroactive adjustment of raw data is scientific fraud, plain and simple. Just how do expect them to win the GW debate without cheating? It is a little hard to see what is going on since one table is ranked according to size of anomaly, and the other is chronological. 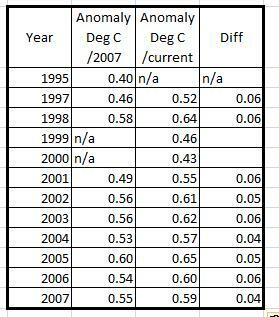 It seems that 2005 is warmer than 1998 in both tables, and, of course, both are cooler than 2014, at 0.69C. This analysis doesn’t quite explain the nub of the adjustments going on. Well, here is a simple comparison chart. It does make it all a little bit clearer. Exactly! It is astounding that they continue to change their baseline. Zeke claims TOBS adjustments of only .05 degrees. We are talking about adjustments of 20 to 80 times that. Add in station changes, homogenization ever increasing, along with ever fewer stations, add in adjusting the rural stations to match the urban stations (now confirmed) add in a non-adjustment for UHI, the entire data set is truly FUBAR. What Paul Homewood, and Goddard, Booker and others are doing is a well-respected procedure in financial accounting. The Auditors must determine if the aggregate corporation reports are truly representative of the company’s financial condition. In order to test that, samples of component operations are selected and examined to see if the reported results are accurate compared to the facts on the ground. We are learning from this that GHCN only supports the notion of global warming if you assume that older thermometers ran hot and today’s thermometers run cold. Otherwise the warming does not appear in the original records; they have to be processed, like tree proxies. Not only is the heat hiding in the oceans, even thermometers are hiding some. Once you accept that facts and figures in the historical record are changeable, then you enter Alice’s Wonderland, or the Soviet Union, where it was said: “The future is certain; only the past keeps changing.” The apologists for NCDC confuse data and analysis. The temperature readings are facts, unchangeable. If someone wants to draw comparisons and interpret similarities and differences, that’s their analysis, and they must make their case from the data to their conclusions. Usually, when people change the record itself it’s because their case is weak. Well put. The methodology is the same. However, once an auditor starts finding an anomaly or irregularity, they do not just find more examples. They try to determine the extent of the implications. That is a much bigger job. The problem with constantly changing the data is that you lose sight of what is originally there, so start imposing patterns in the data according to what seems reasonable. An accounting analogy is with accruals in the 1980s. So many were made to smooth anomalies that it was easy to lose sight of where actual costs were. At a year end such adjustments would make a material difference to the accounts, with long, and very reasonable, stories constructed to justify them. Since then accounting standards have developed, barring some types and making sure others follow strict rules. In some cases it may bar adjustments that would improve the “true and fair” view of the accounts, but it increasing transparency and meaning. Thank you, Paul. Can you explain how independent clomatologists like Prof Judith Curry overlooked these changes in temperature data? National records in Argentina sttarted in 1961. They must be joking! 1861 is more appropiate. It just proves that the warming is man made, as we were told all the way. Paul, what do you make of this ? Note, if you strip back the url.. it leads to ThinkProgress..
….. so its almost certain to be a load of cods !! Definately the Global Warming is 100% Antropogenic. It was created by a bunch of failed/mediocre climatologists in desperate need of funding. They “corrected” the data so that they could convince a bunch of gullible politicians and a large cadre of journalists who have something to gain in this scam, also. A new series starts on BBC Four on March 2nd. Video of the surface of the Sun with “.85 DEGREES CELSIUS” superimposed on it. Image of a glacier (?) with 95% superimposed on it. Video of a gas flare stack (?) with “ONE TRILLION TONNES”. It’s difficult to judge from the short trailer, but I don’t anticipate anything other than the usual BBC bias. What that actually means is that either the People putting together the 1997 data or the people (who may even be the same ones) putting together the later data are totally incompetent to have got it so wrong. Show that to a Warmist and their immediate response is “ho it must be a baseline thing”, but they are very clear in the summaries about the anomalies and base lines, but all the later summaries never make the mistake of giving the ACTUAL temperature as they did in 1997. You seem to be comparing apples and oranges. Your number of 58.24 was base on all of the 20th century, while the 62.45 was just for 1997. In 1997, they said the actual temperature was 62.45F. For 2014, they said it was 1.24F above the 20thC average of 57.0F. Funny how all warmists have Reading comprehension problems. NOAA reports global temperatures within 0.01 degrees, but have altered them by 400 times that much since 1997. Junk science at its worst. Zeke has spent hours and hours writing this up to no avail.This posting above alone demolishes the whole defense argument (its not related but its “always goes up bias” is the basic problem. They are going to claim the adjustments are very small, and actually make the warming less. They will claim only a .05 adjustment for TOB. I have seen Mosher actually claim this. The skeptics must be prepared to show them what the true adjustments have been, and using their own past records is the best method to do this. The question is why is NOAA fiddling around with the temperature data so much? Makes one wonder if the data is of any value at all much less be used to make climate and energy policy with.